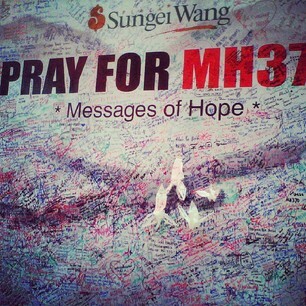 The search continues for the plane that went missing between Kuala Lumpur and Beijing with 239 people on board. If you want to know about how easy it is to turn off an airplane's transponder, a device which wirelessly transmits and receives electrical signals, check out our interview with aviation safety expert Steve Preteska. "There have been so many contradictions that it’s hard to pinpoint exactly when the Malaysians stopped talking sense," Amy Davidson of the New Yorker. India on Sunday put on hold its search for missing Malaysia Airlines flight MH370, at the request of the government in Kuala Lumpur, which wants to reassess the week-old hunt for the Boeing 777 that is now suspected of being hijacked. It's more of a pause. 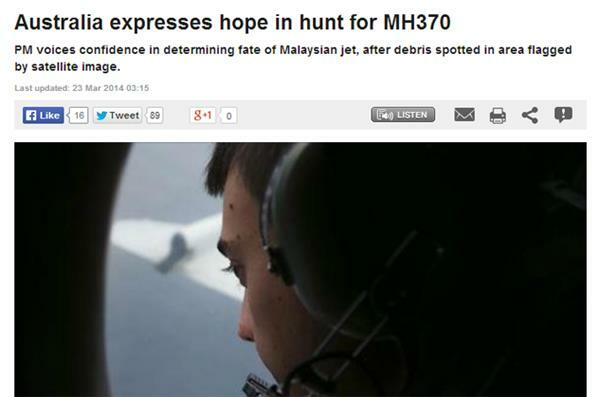 The Malaysian authorities are reassessing the situation. They will figure whether they need to shift the area of search. Malaysia's government said on Sunday that police had searched the homes of the two pilots of a missing airliner and were examining the captain's home flight simulator, but cautioned it was "normal" procedure. "We appeal to the public not to jump to conclusions regarding the police investigation." Malaysia's government says police are examining an elaborate flight simulator that one of the pilots of the missing Malaysian airliner had set up in his home. Malaysia's Transport Ministry said on Sunday that police have searched the homes of both the pilot and co-pilot the previous day. 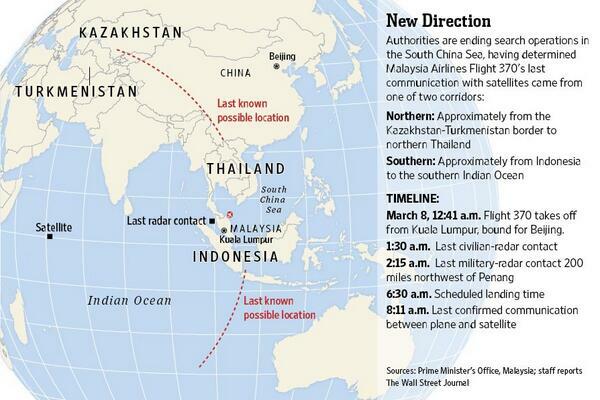 Twenty-five countries are now helping with the search for the missing Malaysia Airlines jet. The plane appears to have been deliberately steered off-course eight days ago, with 239 passengers on board. Al Jazeera's Florence Looi reports from Kuala Lampur. 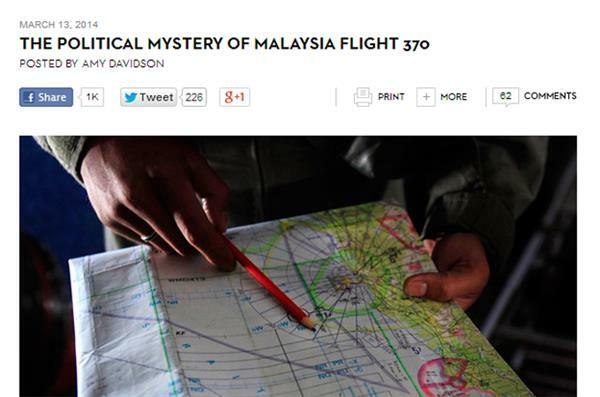 "The contradictory and piecemeal information Malaysia Airlines and its government have provided has made search efforts difficult and the entire incident even more mysterious. What else is known that has not been shared with the world?" The number of countries involved in the search and rescue operation has increased from 14 to 26. These countries are: Malaysia, Australia, Bangladesh, Brunei, China, France, India, Indonesia, Japan, Kazakhstan, Kyrgyzstan, Laos, Myanmar, New Zealand, Pakistan, Philippines, Russia, Singapore, South Korea, Thailand, Turkmenistan, UAE, UK, US, Uzbekistan, and Vietnam. Intelligence checks on the 153 Chinese passengers aboard a missing Malaysian airliner produced no red flags, China said on Tuesday, as investigators struggled to clarify events that led to the plane's dramatic disappearance. China's ambassador to Malaysia Huang Huikang said no evidence had been found that would link anyone to a possible hijacking or terrorist attack on the jet, the official Xinhua news agency reported. Huang also said China had begun searching for the aircraft in its own territory but gave no further details. Australia's maritime safety agency said on Tuesday it had sharply reduced its search for the missing Malaysia Airlines jetliner to a 600,000 sq km corridor in the southern Indian Ocean, but that is still roughly the size of Spain and Portugal combined. 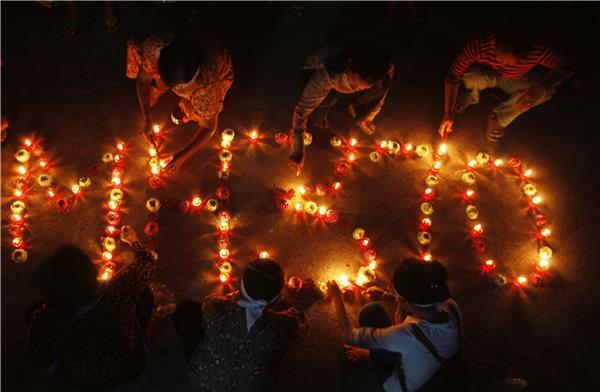 Residents of Boeung Kak Lake held a Buddhist ceremony, praying for the missing Malaysia Airlines MH370, in Phnom Penh on Saturday. 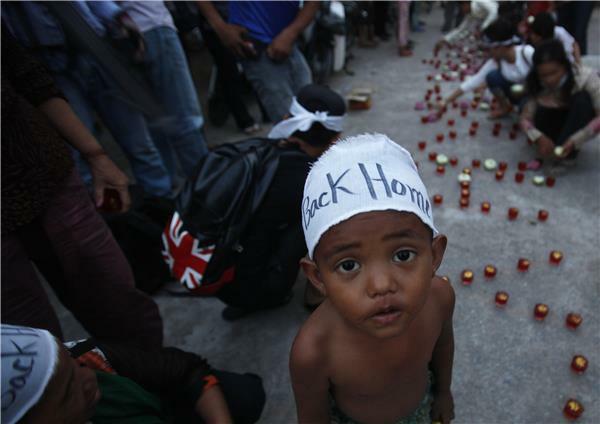 The ceremony also included prayers for the release of 21 detainees who have been jailed since January 3, when military police opened fire on workers striking over low pay, killing four people. 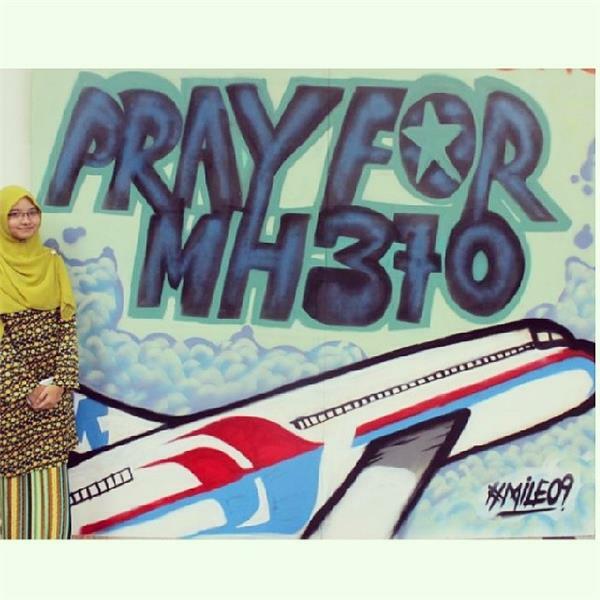 Malaysia rejected criticism on Tuesday from US government officials that it has not been sharing as much information as it could with foreign governments about the disappearance of passenger jet more than a week ago. "It's up for the FBI to tell us if they need more experts to help because it's not for us to know what they have." Police in the Maldives are probing reports that islanders in the tourism paradise saw a "low-flying jumbo jet" on the day the missing Malaysia Airlines plane vanished, according to the AFP news agency. Malaysian authorities dismissed reports that islanders from the Maldives had seen a "low-flying jumbo jet" that could have been the missing MH370 plane, implying another false alarm in the 11-day search for the aircraft. Malaysian Transport Minister Hishammuddin Hussein told reporters at a news conference in Kuala Lumpur on Wednesday afternoon that the Maldives air force chief had informed him that the reports were "not true". Police in the Maldives, a honeymoon destination in the Indian Ocean, began investigating on Tuesday after the national Haveeru newspaper reported that residents of a remote southern island had spotted a large plane flying over them on March 8. Australian Prime Minister Tony Abbott said on Thursday satellite imagery had found two objects possibly related to the search for Malaysia Airlines flight MH370. Missing since March 8 with 239 people on board, Abbott told parliament "new and credible information has come to light in relation to the search... in the south Indian Ocean." "The Australian Maritime Safety Authority (AMSA) has received information based on satellite imagery of objects possibly related to the search." Abbott said aircraft were en route to the area where the objects were found. According to the Associated Press, the Orion aircraft was expected to arrive in the area in Thursday afternoon with three additional aircraft expected to follow for a more intensive search. 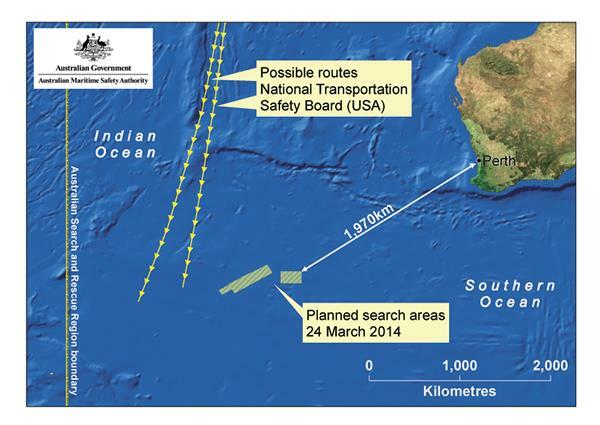 Abbott cautioned, however, that the task of locating these objects would be extremely difficult and "it may turn out that they are not related to the search for flight MH370." Al Jazeera's Nicole Johnston reports from Kuala Lumpur, Malaysia on the latest developments of the missing Malaysian Airlines passenger plane. The US military's search for the missing Malaysian jetliner has cost $2.5 million so far, the Pentagon estimated on Friday, adding it has set aside about $4 million for the hunt so far, enough to cover operations through to early April. It was the first disclosure of costs for the US ships and aircraft joining the search for Malaysia Airlines Flight MH-370, which went missing almost two weeks ago with 239 people aboard. The United States initially dispatched the Navy's guided-missile destroyer USS Kidd, as well as the USS Pinckney, to comb the seas for any signs of wreckage. Search planes scoured a remote patch of the Indian Ocean but came back empty-handed on Friday after a 10-hour mission looking for any sign of the missing Malaysia Airlines jet, another disappointing day in one of the world's biggest aviation mysteries. But Australia's acting prime minister, Warren Truss, tamped down expectations. "Something that was floating on the sea that long ago may no longer be floating - it may have slipped to the bottom,'' he said. "It's also certain that any debris or other material would have moved a significant distance over that time, potentially hundreds of kilometres." In Kuala Lumpur, Malaysian Defence Minister Hishammuddin Hussein thanked the more than two dozen countries involved in the search that stretches from Kazakhstan in Central Asia to the southern Indian Ocean. A suspicious object spotted bya Chinese satellite was floating 120 km from possible debris announced by Australia in the search for a missing Malaysian jet, the official Xinhua news agency has said. "The location of the suspicious object is along the southern corridor missing Malaysia Airlines Flight MH370 might have taken," it said on Saturday , adding the object was spotted on March 18, two days after the satellite image announced by Australia. Australia's prime minister has expressed hope in the search for Malaysia Airlines flight MH370, after debris was spotted that is consistent with satellite images released by China. Tony Abbott voiced confidence in the search effort on Sunday after unidentified debris was seen by air observers on a civil aircraft during Saturday's mission. 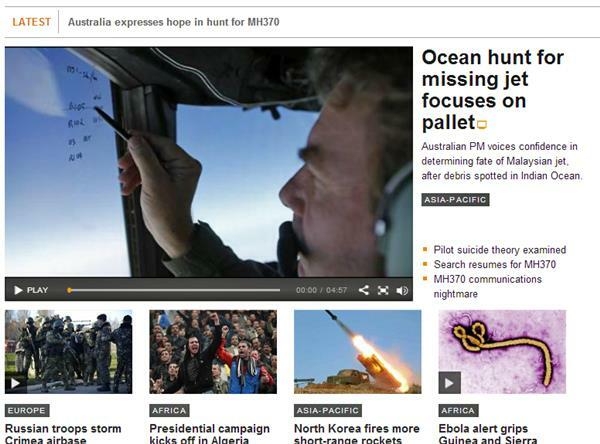 To read Al Jazeera's full story click here. "It's still too early to be definite, but obviously we have now had a number of very credible leads and there is increasing hope - no more than hope, no more than hope - that we might be on the road to discovering what did happen to this ill-fated aircraft," said Australian Prime Minister Tony Abbott. Critics say disorganised search effort of missing Malaysian passenger aircraft highlights how Asian neighbours do not cooperate enough. As the hunt for Malaysia Airlines Flight 370 enters a third week, the piecemeal returns from one of the most intense, international searches in living memory have delivered a public and institutional shock that could force a major rethink about aviation security. "There's no doubt that what has gone on is one of the greatest mysteries of modern aviation and it will have an impact on the global aviation and airline industry," Jonathan Galaviz, partner at the US-based travel and aviation consultancy firm Global Market Advisors, told AFP news agency. "I expect there will be a real examination of the kind of recording technology we have right now in airplanes, a debate on how they are designed and how long they can last," Galaviz said. An intense search is underway in the southern Indian Ocean for signs of possible debris from the Malaysia Airlines Boeing 777 that went missing on March 8. Here is a list of the countries taking part and what they have sent to help the search overseen by Australia from a military base near the southwestern city of Perth. AUSTRALIA: Two military P3 Orion planes; four non-military jets; the navy supply ship HMAS Success. CHINA: Two Ilyushin IL-76 planes; warships Kunlunshan, Haikou and Qiandaohu; icebreaker Snow dragon. JAPAN: Two P3 Orion planes. NEW ZEALAND: One military P3 Orion plane. 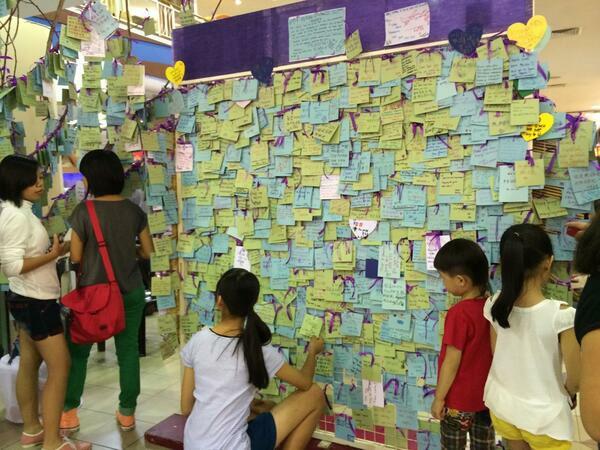 Tributes for the missing Malaysian plane and the 239 people on board. Chinese aircrew have spotted "suspicious objects" in the southern Indian Ocean in the search for vanished Malaysia Airlines flight MH370, the official Xinhua news agency said on Monday. It gave no immediate further details, but an earlier Xinhua report said a Chinese military plane set off early on Monday from the western Australian city of Perth to seek "suspicious debris" floating in the remote waters captured by satellite imagery. After 17 days of searching for missing Malaysia Airlines jet, the country's officials said an analysis of satellite data points to a "heartbreaking" conclusion: Flight 370 met its end in the southern reaches of the Indian Ocean, and none of those aboard survived. Prime Minister Najib Razak said analysis showed that the missing plane, which took off from Kuala Lumpur for Beijing early on March 8, veered "to a remote location, far from any possible landing sites." "It is therefore with deep sadness and regret that I must inform you that, according to this new data, Flight MH370 ended in the southern Indian Ocean,'' he said. Officials said they concluded that the flight had been lost in the deep waters west of Perth, Australia, based on more thorough analysis of the brief signals the plane sent every hour to a satellite belonging to Inmarsat, a British company, even after other communication systems on the jetliner shut down. Malaysia's Prime Minister Najib Razak has informed the families of those missing on flight MH370 that the plane likely crashed in the Indian Ocean west of Australia. Malaysia Airlines Flight MH370 diasppeared less than an hour after take-off from Kuala Lumpur for Beijing. No confirmed sighting of the plane has been made, but debris has been found in remote waters off Australia which might be part of the missing plane. Al Jazeera's Andrew Thomas reports from the Southern Indian Ocean. China has demanded that Malaysia turn over the satellite data used to conclude that that Flight MH370 had crashed in the Indian Ocean. Deputy Foreign Minister Xie Hangsheng told Malaysia's ambassador to Beijing late Monday that China wanted to know exactly what led Najib to announce that the plane had been lost, a statement on the ministry's website said. The conclusions were based on a more thorough analysis of the brief signals the plane sent every hour to a satellite belonging to Inmarsat, a British company, even after other communication systems on the jetliner shut down for unknown reasons. Our sole and only motivation last night was to ensure that in the incredibly short amount of time available to us, the families heard the tragic news before the world did. Wherever humanly possible, we did so in person with the families or by telephone, using SMS only as an additional means of ensuring fully that the nearly 1,000 family members heard the news from us and not from the media. In a press briefing on Monday, Malaysia defence and acting minister of transport, Hishammuddin Hussein, said his country is now focused on narrowing the search area, adding the challenge to finding the ill-fated jetliner is "primarily technical and logistical." "As the search area has narrowed, new challenges have arisen, including managing resources in a remote search and rescue effort." he added. New satellite images have revealed more than 100 objects in the southern Indian Ocean that could be debris from the missing plane, Malaysia's acting transport minister said. Hishammuddin Hussein told a news conference that the images were captured by France-based Airbus Defence and Space on March 23. What are the search parties looking for? They're commonly called black boxes, but the flight data recorder and the cockpit voice recorder are actually orange - so they can be more easily seen. The data recorder logs performance and other metrics, including speed, altitude and direction. In all, it can keep 1,000 different measurements, giving investigators a rich cache of information. Those measurements cover the 25 hours prior to a crash. The voice recorder captures two hours of sound from several microphones in the cockpit. It runs on a continuous loop, so audio from the critical moments during which the plane diverted west from its Malaysia-China route - about seven hours before it is believed to have crashed - have been erased. Why the race against time to find these recorders? Each recorder has its own beacon, bolted to the box's outside, which once activated by water emits a chirp every second. The chirp can't be heard by the naked ear - it requires special equipment to detect. A beacon's battery is designed to last 30 days. Once that month is up, the pings begin to fade in the same way that a flashlight with failing batteries begins to dim. According to Chuck Schofield of Dukane Seacom Inc., a company which has sold pingers to Malaysia Airlines, the batteries might "reliably'' give five extra days before dying. The specific length depends on factors including maintenance and temperature. Authorities believe the plane crashed March 8. So the pingers would begin to fade around April 7, and could go silent around April 12. The US Navy on Wednesday deployed a Towed Pinger Locator, a device that's pulled behind a vessel at slow speeds, and an unmanned underwater vehicle to Perth in western Australia. The equipment will be fitted to an Australian vessel, which according to Malaysia is expected to reach the search area April 5. Wouldn't the crash have destroyed the black boxes? The data and voice recorders are tough. Honeywell Aerospace made the boxes in the missing Malaysia Airlines plane. They are engineered to survive a super-hot fire for an hour, stay intact during a violent impact, and withstand the tremendous pressure of being under 20,000 feet of water, Honeywell spokesman Steve Brecken said. Ocean depths in the search area average roughly 10,000 to 15,000 feet. The flight data recorder should retain its information for at least two years. 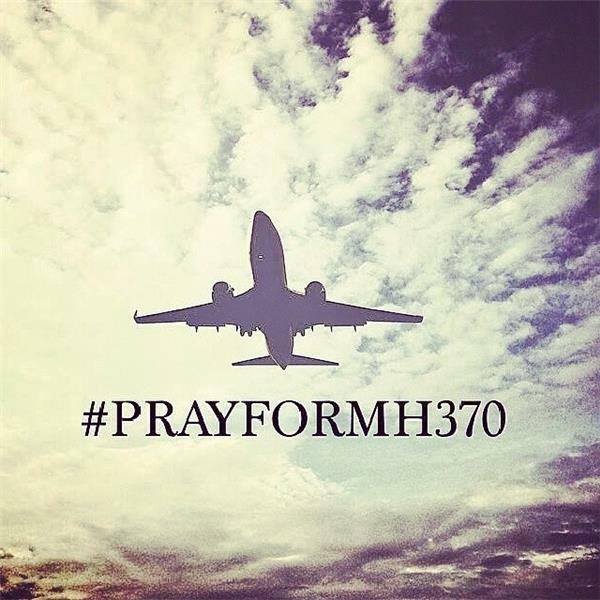 Will the case of MH370 bring a change to Aviation safety devices? After the crash of an Air France flight in the Atlantic Ocean in 2009, searchers did not locate the black boxes for nearly two years. Aviation regulators began a push to extend battery life, and the European Aviation Safety Agency will require a 90-day pinger starting next year. Several years later, a second regulatory change kicks in - a much larger pinger must be added to the structure of the air frame. That would give searchers a second signal to track, one that can be detected up to 13 kilometers away. The black box pingers have a range of about four kilometers. A Thai satellite has detected about 300 objects floating in the Indian Ocean near the search area for Flight MH370, officials said Thursday. Anond Snidvongs, director of Thailand's space technology development agency, said the images showed "300 objects of various sizes" in the southern Indian Ocean about 2,700 kilometers southwest of Perth, Australia. Some of the objects were estimated at up to 16 meters long, he said. The images were taken by the Thaichote satellite on Monday, took two days to process and were relayed to Malaysian authorities on Wednesday. Anond says the objects were about 200 kilometers from the area where a French satellite on Sunday spotted 122 objects. It remains uncertain whether the objects are from the missing flight. Mathematicians at a scientific firm who discovered missing Air France jet deep beneath the Atlantic are preparing to look for Malaysia Airlines Flight 370. Metron, a scientific consulting firm, has already started work with data currently in the public domain. "We're trying to get our hands on all the publicly available data so we can start doing an independent assessment," Van Gurley, a senior manager in Metron's advanced mathematics applications division, told the AFP news agency on Wednesday. Founded in 1982, Metron conducts highly specialised analysis for US national security applications, such as sonar systems. In the case of Air France Flight 447, which crashed into the Atlantic in 2009 with 228 on board, the target was its flight data recorder lying at the bottom of the ocean.